One of the first decisions the design team must make is the type insulation to be used in the house. This choice not only affects the thermal values that protect from heat loss and gain, but how the house will be built. Fiberglass, by far the most common, is small thread-like fibers of glass “meshed” or “woven” together to form a thick blanket. The air trapped by the fibers form the insulation qualities we are looking for, giving us about R- 3.5 per inch. The batts are available in many forms, usually precut for a cavity formed by the 2x framing members of the wall. The wall thickness may vary from 2x4 for R-13 or a 2x6 for an R-19. There are many other possible variations with thicker walls or double wall framing systems, and the on center spacing of studs has many options. There are also higher density with higher R-value batts. The precut batt is generally stapled into place. This is a well proven approach and very cost effective system requiring few tools or experience. However, the installation process traditionally is very sloppy and poorly done, reducing the actual insulation levels because of air movement in the wall. RESNET, for a HERS Rating, has a rating system evaluation installation ranging from grade 3 (sloppy) to grade one (near perfect). To obtain a “grade one” install, it is best to front staple instead of side stable. See your Energy Strategy Study for more details. A “grade one install” generally costs more money, so the next two cavity insulation systems become good options to investigate. Spray Fiberglass is just what it sounds like. It is the same material as above but not meshed together as a batt. Instead, it is sprayed in the wall with “glue” that helps hold it together. This fills the cavity much more completely reducing the chance of air flow inside the wall. Pipes and wires that cause issues with batts are completely surrounded by this insulation process. The normal expected result in a 2x4 wall would be R-15 instead of an R13, and a 2x6 would be R-21 in place of R-19. This process does require spraying equipment and experience in proper installation. So as a result it will cost a little more. However, the “grade one” requirement is easily met. nd LEED for Homes. This is often a locally produced product, keeping jobs in the local community. 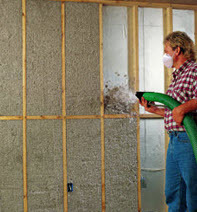 Rockwool is another option to insulate cavity type walls. Rockwool is not as common in all places but like cellulose is a denser product reducing air flow through the product as a result. The density of a product also aids in sound control. Rockwool is made from many products but is usually produced from molten rock. As a result there are many built in benefits such as fire and mold control. Thermal performance is typical to the other cavity filling products. Continuous exterior insulation foam board on the outside of wall cavities has a major effect on overall thermal values. While the insulation in the cavity is R-13+ to 19+, the studs remain with an R-value of R-4 to R-5. This means about 15 % to 23% of the wall is about one-third the insulation level. By adding foam board on the exterior we can get an added R-3 to R-7 increase in thermal protection. On a 2x6 wall R-26 is very possible with R10 at the stud and header areas. The 2012 IRC building code has many flexible ways to meet the insulation requirement. All of the above systems can be combined in one way or another to satisfy these requirements. The Zip system has an OSB w/ foam board glued on the back and DOW has a structural insulated sheathing system called SIS. 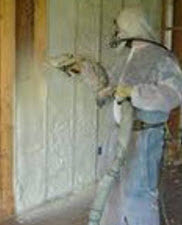 Spray Foam open cell is manufactured from various products, with the most common being polyurethane. As it is sprayed it chemically combines and forms a sponge like product that continues to expand forcing itself to fill all cracks, holes and seams. Open cell foam is considered an air barrier, but still allows moisture to migrate through it. This is the recommended foam for Zone 4 mixed humid, because it allows moisture to escape the wall if necessary. Depending on the formula the R-values can range from 3.5 to 5.5 per inch. But because of the restricted air movement its performance is much better that most other products. This product excels in some attic applications such as cathedral ceilings and undersides of the roof deck. It gives the design team many great design options to increase a home’s energy performance. With the added benefits come extra cost in highly trained installers, and high-tech spraying equipment. Experience here is very necessary. There are also added code requirements that vary from product to product, so these must be checked out in each code area before selecting which spray foam to use. Spray Foam closed cell is typical to open cell, but the cells are closed. This results in a hard plastic product that will not let anything move through it. Closed cell foam actually adds some structural integrity to a wall. It also gives a much higher R-value, often about R-7 per inch. It is the ultimate product for the northern parts of the US and Canada. However, it is not necessarily recommended in our mixed humid zone 4. This does not mean it cannot be used, but that if it is used, dehumidification may need to be added to the house to protect from the possibility of mold. This closed cell is the perfect answer to below grade applications such as crawl spaces and basements with the proper code-required installation. The cost of closed cell is higher, but less foam is required to get the same R-values. There are other types of construction that do not involve cavities in which insulation must be applied. Here are some of the most common. 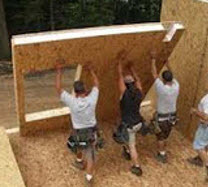 SIPs, structurally insulated panels, are made from products li ke OSB with a rigid foam board glued between. The foam is general 5” thick giving a great R-value. The panels become the structural system itself and is often used for the floor and the roof. When properly installed and caulked and sealed this is a very tight product and very strong. It offers added storm protection and thermal and infiltration qualities. The manufacturer often installs the panels providing rapid built times. ICF, insulated concrete forms come in many configurations. The most common is large hollow foam blocks that snap together forming a wall that is then filled with re-bar and concrete. The result is a highly-insulated, storm-resistant wall that has no infiltration. There is also the added mass of the wall that reduces temperature swing time. This system requires an experienced builder with knowledge of ICF construction, but results in a home unlike normal construction. Much more can be said about all of the above products. Each offers advantages and disadvantages. The design team must balance the cost, shape, location, and features of a project to choose the best answer. There are many Code requirements on insulation that go beyond R-value. These tend to vary from inspection district to inspection district. They range from fire safety, air quality, application requirements, and mold potential to name a few. All of these factors must be evaluated for each project. As a HERS Rater I have seen great success from each product, with the result depending more on the quality of installation than the product. These are the most common insulation systems. There are many options with each and many other systems, some cutting edge, and some very old. The cost varies greatly and depends upon your location for the best system for your project.